WinINet enables applications to navigate and manipulate directories and files on an ftp server. Because CERN proxies do not support FTP, applications that use a CERN proxy exclusively must use the InternetOpenUrl function. For more information about how to use InternetOpenUrl, see Accessing URLs Directly. To begin an FTP session, use InternetConnect to create the session handle. Enumerate, create, remove, and rename directories. Rename, upload, download, and delete files. Navigation is provided by the FtpGetCurrentDirectory and FtpSetCurrentDirectory functions. These functions utilize the session handle created by a previous call to InternetConnect to determine which directory the application is currently in, or to change to a different subdirectory. Directory enumeration is performed by using the FtpFindFirstFile and InternetFindNextFile functions. FtpFindFirstFile uses the session handle created by InternetConnect to find the first file that matches the given search criteria and returns a handle to continue the directory enumeration. InternetFindNextFile uses the handle returned by FtpFindFirstFile to return the next file that matches the original search criteria. The application should continue to call InternetFindNextFile until there are no more files left in the directory. Use the FtpCreateDirectory function to create new directories. This function uses the session handle created by InternetConnect and creates the directory specified by the string passed to the function. The string can contain a directory name relative to the current directory, or a fully qualified directory path. To rename either files or directories, the application can call FtpRenameFile. This function replaces the original name with the new name passed to the function. The name of the file or directory can be relative to the current directory, or a fully qualified name. To upload or place files on an FTP server, the application can use either FtpPutFile or FtpOpenFile (along with InternetWriteFile). FtpPutFile can be used if the file already exists locally, while FtpOpenFile and InternetWriteFile can be used if data needs to be written to a file on the FTP server. To download or get files, the application can use either FtpGetFile or FtpOpenFile (with InternetReadFile). FtpGetFile is used to retrieve a file from an FTP server and store it locally, while FtpOpenFile and InternetReadFile can be used to control where the downloaded information is going (for example, the application could display the information in an edit box). Delete files on an FTP server by using the FtpDeleteFile function. This function removes a file name that is relative either to the current directory or to a fully qualified file name from the FTP server. FtpDeleteFile requires a session handle returned by InternetConnect. To work properly, the FTP functions require certain types of HINTERNET handles. These handles must be created in a specific order, starting with the root handle created by InternetOpen. InternetConnect can then create an FTP session handle. The following diagram shows the functions that are dependent on the FTP session handle returned by InternetConnect. The shaded boxes represent functions that return HINTERNET handles, while the plain boxes represent functions that use the HINTERNET handle created by the function on which they depend. The following diagram shows the two functions that return HINTERNET handles and the functions that are dependent on them. The shaded boxes represent functions that return HINTERNET handles, while the plain boxes represent functions that use the HINTERNET handle created by the function on which they depend. For more information, see HINTERNET Handles. The following functions are used during FTP sessions. These functions are not recognized by CERN proxies. Applications that must function through CERN proxies should use InternetOpenUrl and access the resources directly. For more information on direct resource access, see Accessing URLs Directly. FtpCreateDirectory Creates a new directory on the server. This function requires a handle created by InternetConnect. FtpDeleteFile Deletes a file from the server. This function requires a handle created by InternetConnect. FtpFindFirstFile Starts file enumeration or file search in the current directory. This function requires a handle created by InternetConnect. FtpGetCurrentDirectory Returns the client's current directory on the server. This function requires a handle created by InternetConnect. FtpGetFile Retrieves a file from the server. This function requires a handle created by InternetConnect. FtpOpenFile Initiates access to a file on the server for either reading or writing. This function requires a handle created by InternetConnect. FtpPutFile Writes a file to the server. This function requires a handle created by InternetConnect. FtpRemoveDirectory Deletes a directory on the server. This function requires a handle created by InternetConnect. FtpRenameFile Renames a file on the server. This function requires a handle created by InternetConnect. FtpSetCurrentDirectory Changes the client's current directory on the server. This function requires a handle created by InternetConnect. InternetWriteFile Writes data to an open file on the server. This function requires a handle created by FtpOpenFile. 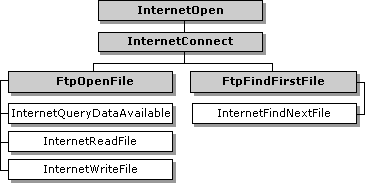 The application establishes an FTP session by calling InternetConnect on a handle created by InternetOpen. InternetConnect needs the server name, port number, user name, password, and service type (which must be set to INTERNET_SERVICE_FTP). For passive FTP semantics, the application must also set the INTERNET_FLAG_PASSIVE flag. The INTERNET_DEFAULT_FTP_PORT and INTERNET_INVALID_PORT_NUMBER values can be used for the port number. INTERNET_DEFAULT_FTP_PORT uses the default FTP port, but the service type still must be set. INTERNET_INVALID_PORT_NUMBER uses the default value for the indicated service type. The values for the user name and password can be set to NULL. If both values are set to NULL, InternetConnect uses "anonymous" for the user name, and the user's email address for the password. If only the password is set to NULL, the user name passed to InternetConnect is used for the user name, and an empty string is used for the password. If neither value is NULL, the user name and password given to InternetConnect are used. Enumeration of a directory on an FTP server requires the creation of a handle by FtpFindFirstFile. This handle is a branch of the session handle created by InternetConnect. FtpFindFirstFile locates the first file or directory on the server and returns it in a WIN32_FIND_DATA structure. Use InternetFindNextFile until it returns ERROR_NO_MORE_FILES. This method finds all subsequent files and directories on the server. For more information on InternetFindNextFile, see Finding the Next File. To determine if the file retrieved by FtpFindFirstFile or InternetFindNextFile is a directory, check the dwFileAttributes member of the WIN32_FIND_DATA structure to see if it is equal to FILE_ATTRIBUTE_DIRECTORY. If the application makes changes on the FTP server or if the FTP server changes frequently, the INTERNET_FLAG_NO_CACHE_WRITE and INTERNET_FLAG_RELOAD flags should be set in FtpFindFirstFile. These flags ensure that the directory information being retrieved from the FTP server is current. After the application completes the directory enumeration, the application must make a call to InternetCloseHandle on the handle created by FtpFindFirstFile. Until that handle is closed, the application cannot call FtpFindFirstFile again on the session handle created by InternetConnect. If a call to FtpFindFirstFile is made on the same session handle before the previous call to the same function is closed, the function fails, returning ERROR_FTP_TRANSFER_IN_PROGRESS. The following example enumerates the contents of an FTP directory into a list box control. The hConnection parameter is a handle returned by the InternetConnect function after it establishes an FTP session. Sample source code for the InternetErrorOut function referenced in this example can be found in the Handling Errorstopic. The FtpGetCurrentDirectory and FtpSetCurrentDirectory functions handle directory navigation. FtpGetCurrentDirectory returns the application's current directory on the FTP server. 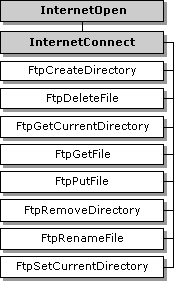 The directory path from the root directory on the FTP server is included. FtpSetCurrentDirectory changes the working directory on the server. The directory information passed to FtpSetCurrentDirectory can be either a partially or fully qualified path name relative to the current directory. For example, if the application is currently in the directory "public/info" and the path is "ftp/example", FtpSetCurrentDirectory changes the current directory to "public/info/ftp/example". The following example uses the FTP session handle hConnection, which is returned by InternetConnect. The new directory name is taken from the edit box of the parent dialog whose IDC is passed in the nDirNameId parameter. Before the directory change is made, the function retrieves the current directory and stores it in the same edit box. The souce code for the DisplayFtpDir function called at the end is listed above. WinINet provides the capability to create and remove directories on an FTP server to which the application has the necessary privileges. If the application must log on to a server with a specific user name and password, the values can be used in InternetConnect when creating the FTP session handle. The FtpCreateDirectory function takes a valid FTP session handle and a null-terminated string that contains either a fully qualified path or a name relative to the current directory and creates a directory on the FTP server. The following example shows two separate calls to FtpCreateDirectory. In both examples, hFtpSession is the session handle created by the InternetConnect function, and the root directory is the current directory. The FtpRemoveDirectory function takes a session handle and a null-terminated string that contains either a fully qualified path or a name relative to the current directory and removes that directory from the FTP server. The following example shows two sample calls to FtpRemoveDirectory. In both calls, hFtpSession is the session handle created by the InternetConnect function, and the root directory is the current directory. There is a directory called "test" in the root directory and a directory called "example" in the "test" directory. The following example creates a new directory on the FTP server. The new directory name is taken from the edit box of the parent dialog whose IDC is passed in the nDirNameId parameter. The hConnection handle was created by InternetConnect after establishing an FTP session. The source code for the DisplayFtpDir function called at the end is listed above. The following example deletes a directory from the FTP server. The name of the directory to be deleted is taken from the edit box in the parent dialog whose IDC is passed into the nDirNameId parameter. The hConnection handle was created by InternetConnect after establishing an FTP session. The source code for the DisplayFtpDir function called at the end is listed above. For more information about using the InternetReadFile function, see Reading Files. If the URL of the file is available, the application can call InternetOpenUrl to connect to that URL, then use InternetReadFile to control the download of the file. This allows the application tighter control over the download and is ideal for situations where no other operations need to be made on the FTP server. For more information about how to directly access resources, see Accessing URLs Directly. If the application has established an FTP session handle to the server with InternetConnect, the application can call FtpOpenFile with the existing file name and with a new name for the locally stored file. The application can then use InternetReadFile to download the file. This allows the application tighter control over the download and keeps the connection to the FTP server, so more commands can be executed. If the application does not need tight control over the download, the application can use FtpGetFile with the FTP session handle, remote file name, and local file name to retrieve the file. FtpGetFile performs all the bookkeeping and overhead associated with reading a file from an FTP server and storing it locally. The following example retrieves a file from an FTP server and saves it locally. The name of the file on the FTP server is taken from the edit box in the parent dialog whose IDC is passed in the nFtpFileNameId parameter, and the local name under which the file is saved is taken from the edit box whose IDC is passed in the nLocalFileNameId parameter. The hConnection handle was created by InternetConnect after establishing an FTP session. MB_YESNO ) == IDYES ) ? An application that must send data to an FTP server, but does not have a local file that contains all the data, should use FtpOpenFile to create and open a file on the ftp server. The application then can use InternetWriteFile to upload the information to the file. If the file already exists locally, the application can use FtpPutFile to upload the file to the FTP server. FtpPutFile performs all the overhead that goes with uploading a local file to a remote FTP server. The following example copies a local file onto the FTP server. The local name of the file is taken from the edit box in the parent dialog whose IDC is passed in the nLocalFileNameId parameter, and the name under which the file is saved on the FTP server is taken from the edit box whose IDC is passed in the nFtpFileNameId parameter. The hConnection handle was created by InternetConnect after establishing an FTP session. ( dwTransferType == FTP_TRANSFER_TYPE_ASCII ) ? To delete a file from an FTP server, use the FtpDeleteFile function. The calling application must have the necessary privileges to delete a file from the FTP server. The following example deletes a file from the FTP server. The name of the file to be deleted is taken from the edit box in the parent dialog whose IDC is passed int the nFtpFileNameId parameter. The hConnection handle was created by InternetConnect after establishing an FTP session. Since this function does not refresh file listings or directory display, the calling process should do so upon successful deletion. Files and directories on an FTP server can be renamed using the FtpRenameFile function. FtpRenameFile accepts two null-terminated strings that contain either partially or fully qualified names relative to the current directory. The function changes the name of the file designated by the first string to the name designated by the second string. The following example renames a file or directory on the FTP server. The current name of the file or directory is taken from the edit box in the parent dialog whose IDC is passed in the nOldFileNameId parameter, and the new name is taken from the edit box whose IDC is passed in the nNewFileNameId parameter. The hConnection handle was created by InternetConnect after establishing an FTP session. Since this function does not refresh file listings or directory display, the calling process should do so upon successful renaming.